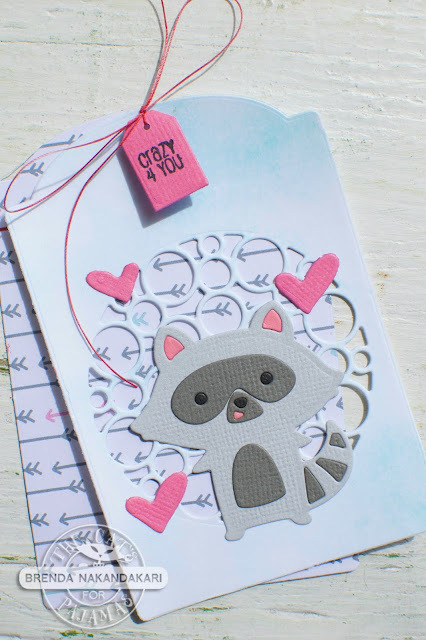 It's time for another TCP Tuesday Challenge over at The Cat's Pajamas Art Stamps. This month, the challenge is to showcase our furry friends. If you take a look in the TCP store, there are so many favorites to choose from. 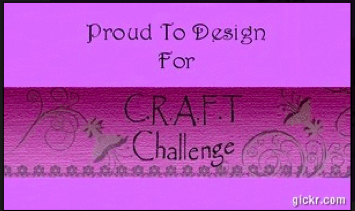 We would love to see your TCP creations, but feel free to use any image for this challenge. I started by cutting 2 tags using the Spring Tag Duo. The top tag was cut from paper smoosched with left over distress oxide ink (DOI) from another project. The other tag was cut from design paper which was left as is. The soft blue DOI tag was die cut with the new Round Bubbles CutUps Duo. The raccoon die was cut twice, once in light grey cardstock and once in dark grey cardstock. The face of the raccoon was cut twice again once in black and once in pink. I put adhesive on the back of the light grey raccoon and put together the other pieces like a puzzle. The pink hearts are from Stitched Big Hugs and were cut from the same pink as his face. They were glued to the background for a bit of extra pop (and because I love those little wonky hearts!). A tiny tag was cut and stamped with a tiny sentiment from Conversation Hearts. A hole was punched in all three tags and the tiny tag was tied on with white button thread that I colored with a coordinating Copic marker. Now this cutie is ready to go on my daughter's little Valentine's goodie. To play along you just upload your design to The Cat’s Pajamas blog page using the InLinkz button. Hope to see you over on the TCP blog! Eee so cute! I love how the bubbles let you see the DP underneath! And that tiny tag is so darn cute!